Daikin is one of the top most companies in the air conditioning industry. The history of Daikin dates back to 1924 when Akira Yamada found the Osaka Kinzoku Kogyosho Limited Partnership in Osaka, Japan. It is Daikin's philosophy and group values that the 90 years old company has strived to reach amongst the top names in the world. At a time, where every invention is integrated with advanced technologies, striving to provide comfort with minimal impact on the environment, is how Daikin functions. It has made its mark globally, with over 90 worldwide production bases. Daikin has always propelled environmental-friendly practices, with every step of its management. From incorporating R-32 refrigerant in residential use air conditioners to inventing air purifying technologies, Daikin's endeavour has always been to maintain harmony between nature and science. And, we are proud to inform that the eco-friendly practices imbibed in our aesthetically designed products are recently been recognised at the National Energy Conservation Awards 2017. 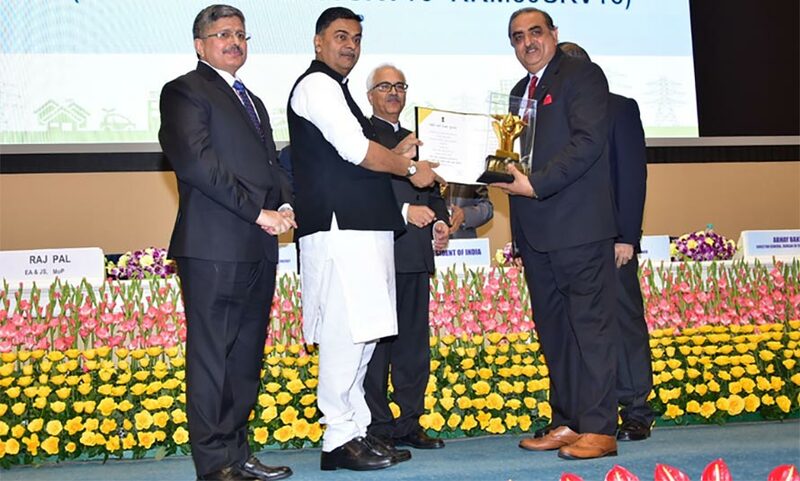 It is an initiative by the Bureau of Energy Efficiency, Government of India, Ministry of Power, to acknowledge industries which perform exceptionally well and achieve efficient utilisation and conservation of energy levels, and we are honoured to receive the Most Energy Efficient Appliance (Fixed & Variable speed Air-Conditioner) Award for the JTKM50 series. Daikin's JTKM series is equipped with advanced technologies and is designed to cater the Indian market. Here are some features which ensure that this series of air conditioners perform efficiently, as well as, the reason behind winning the most energy efficient air conditioners award. Intelligent Eye: It’s an inbuilt infrared sensor that detects the movement of the occupants for providing better airflow and optimum comfort by stabilizing the temperature automatically. For instance, if the Intelligent Eye feature senses no movement in the room for 20 minutes, then the unit automatically adjusts the set points by 2 degree Celsius, eventually leading to less energy consumption. Additionally, it prevents the airflow from directly being blown at the people in the room. Furthermore, the sensor offers 3 D airflow, i.e., working in all directions - up, down, left and right. Coanda Airflow Technology: It’s a state-of-the-art feature that provides draftless, pleasant air conditioning in every corner of the room. It enables the consumer to enjoy even and pleasant air flow throughout the room. Indoor Quiet Operation: As the name suggests, this feature enables the air conditioning unit to function quietly. Therefore, offering absolute silence so that you can work efficiently. Power Chill Operation: This technology is an impeccable addition to Daikin's award series, perfect for the Indian weather. This feature enables the unit to quickly maximize the cooling effect in any operation mode. It is best used for immediate respite from escalating temperatures during the summer months. Streamer Discharge Technology: Daikin's JTKM series is also equipped with advanced streamer discharge technology, which makes the air conditioning unit work as an air purifier, as well. This technology creates a wider plasma discharge, resulting in an oxidative reduction of virus, bacteria, bad odour, smoke, allergens and other harmful chemical substances. The Streamer Discharge then breaks down the molecules into safe nitrogen and oxygen atoms, resulting in clean air. These benefits unequivocally make the Daikin JTKM50 series the most advanced and must-have air conditioning unit in India. So, bring home Daikin air conditioners and provide your loved ones with unparalleled comfort. You can also choose from a wide range of other reliable and flexible air conditioning and air purifying solutions according to your necessity. But, no matter what you choose, comfort and energy-efficiency are guaranteed with Daikin.